What’s the hardest part of running a roleplaying game? It has to be the preparation. You can’t just spontaneously say, “Let’s play a roleplaying game” unless someone’s already spent hours preparing an adventure for the group. But what if running a great game didn’t require any more effort for the game master than it does for the players? What if you could get up and running in—literally—just five minutes? Strange Revelations: Ten Instant Adventures for The Strange makes prepping for an RPG no more difficult or time consuming than setting up a board game, while showcasing the wonder and weirdness of the many recursions lying in the Shoals of Earth. This is a must-have for beginning and veteran GMs of The Strange. These aren’t adventure seeds—they’re complete adventures in an innovative format that requires minimal prep. Run them as one-shots or drop them into your ongoing campaign when you don’t have time to prep your own adventures. You can even run them together as a campaign for months of effortless play! Ten adventures on Earth and across numerous recursions, complete with maps, NPCs, and all the details you expect. An innovative format for adventures: five minutes of prep gets you started, with no need to read pages and pages of text in advance. An escape from a post-apocalyptic cannibal wasteland, a horror-themed board game that exerts bizarre powers over its players, a medieval wardrobe that opens into a hellish realm, and much, much more. 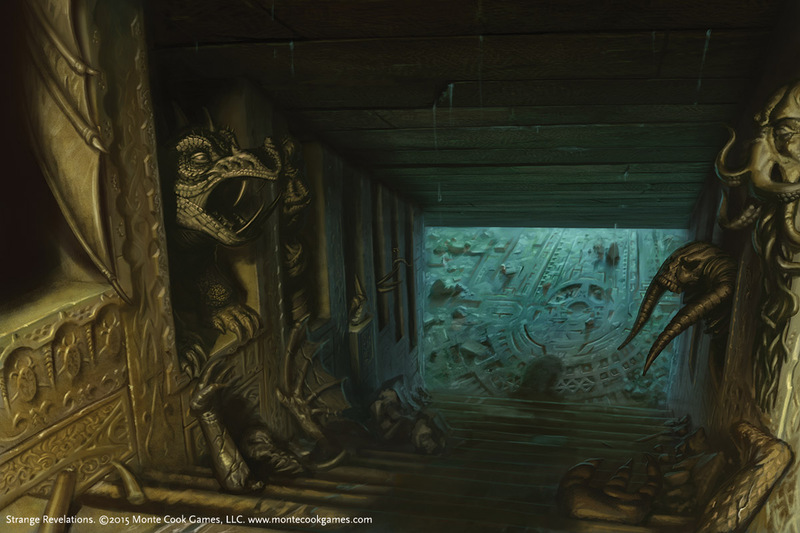 Beautiful, full-color Show ’Em illustrations to reveal to players during the adventures. Six pregenerated characters that get you playing in minutes. A handy rules cheat sheet to make things run even more smoothly. Protect Earth from a malefic Lovecraftian entity. Search for salvage on a derelict spacecraft. Set off into the dark energy of the Strange itself to defend the Orb of Worlds. 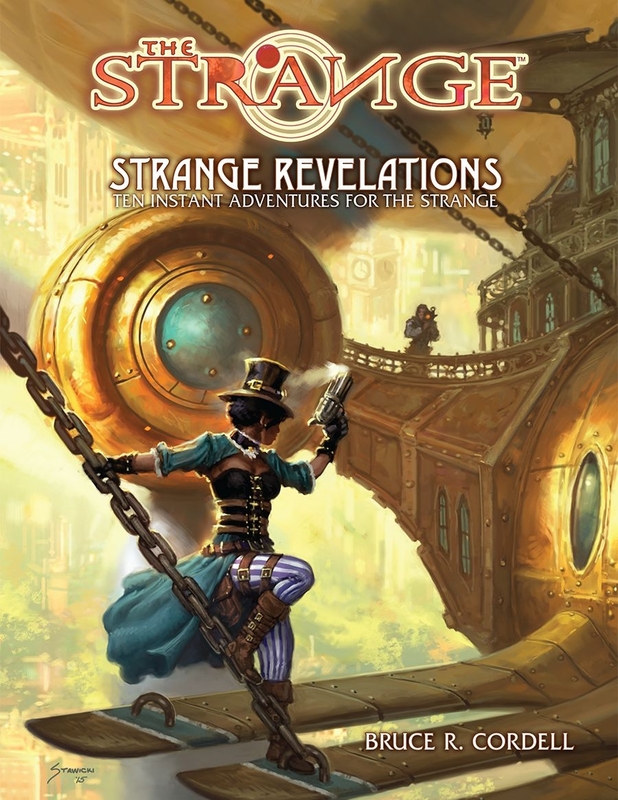 Strange Revelations is a must-have for beginning and veteran GMs of The Strange, and anyone who’d like to play RPGs as easily and spontaneously as board games! Since Strange Revelations is coming out soon, we thought we’d provide some suggestions for prepping these Instant Adventures to play with your friends or family over the holidays, or whenever. Those of us here in the US have a four-day weekend coming up, usually spent with family and friends—what better time for an RPG adventure or two?